Dramatic Eclipse, inspired by the Twilight Saga, is an alluring bouquet. As in an eclipse, the Asiatic lilies are initially concealed from sight. 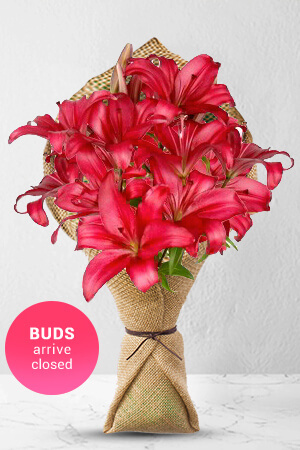 Then as they open and bloom, they will stun you with their beauty.Lilies may be sent closed/partially closed in order to prevent damage and to last longer.Vase not included however; we recommend adding a Standard Vase to add to the element of surprise. Everything was great - was able to change the delivery address after I'd placed the order. Very helpful! The recipient was also very pleased! Thanks! Found you easy to deal with and the flowers were lovely and fresh. Easy ordering and delivered on time to the correct address, which is a good thing. The recipient was overjoyed and loved the arrangement. Job well done.